Watch the video to see some Claymagination Art Camp project previews. When summer rolls around each year, you have to make a decision about what to do with your children during their time off from school. While some parents are fortunate enough to be able to take the summer off and go on vacation, this might not be the case for you. If it is important to you that your children stay occupied, you likely do a good amount of research to find a camp that has activities which will keep your children developing, occupied, and interested. You have a number of options to choose from, which can make it difficult to know where to send them. At Clay Cafe Studio, we are happy to provide children in Falls Church and the surrounding area with a safe and fun place to come during the summer. 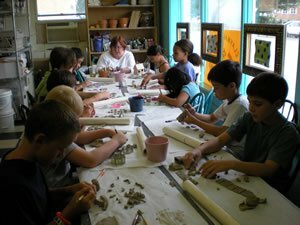 There are many benefits to choosing an artistic summer camp for your children. For one, they may learn that they have a special place in their heart for art and creation. Exposing your children to the wonders of painting and glass fusing can help to improve their concentration, ability to observe, eye and hand coordination, as well as teaching them new skills. All of our classes are taught to small groups by caring, friendly, and experienced teachers. Art engages the mind and body together, teaching children qualities such as patience, expressivity, and the rewards of a job well done. 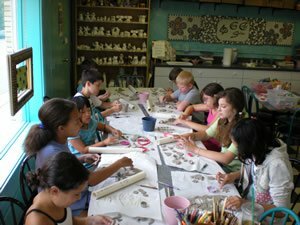 Attending art camp at Clay Cafe Studios is the perfect way to encourage your child’s inner artist in a social, fun, and supportive setting. Art projects, including ceramics and pottery painting, help children develop and improve their fine motor skills through manipulation of clay, brushes, pencils, and more. Ceramic painting and other activities can translate into benefits outside of art as well, such as improved hand-eye coordination and better penmanship. In today’s technology-packed world, it can be easy for children to find distraction around every corner. Creating art is a wonderful way to teach children to focus on a single task at hand and find pleasure in the setting they are in for improved academic performance and enjoyment of time spent with family and friends. The ability to see a project through to completion holds many rewards. When your child sees his finished art, he will feel a sense of satisfaction and improved self-esteem that he can carry into other activities and challenges. Every week of our summer camp has different activities to keep kids who attend more than one session interested. We have a large number of repeat campers throughout the summer and we want to ensure that your children have a varied and interesting curriculum. Our camp is art-intensive and is available in one-week sessions throughout the summer and is intended for children who are 6 and up. Are you interested in registering your children for one or more weeks of our upcoming summer camp? If you would like to learn about the activities of any given week or more about our exciting summer camps, give us a call today at (703) 646-6007!